The EUR/RON tested the 4.69 level yesterday but likely ran into official offers as suggested by clustered trading and a spike in turnover around fixing time. Nevertheless, the official fixing once again marked a historic high, which could suggest that the central bank is aiming to smooth the speed of the Romanian leu's weakening, rather than stop/reverse it. Apart from the high FX pass-through, the National Bank of Romania is likely tormented by memories of the past when domestic savings were highly euroized. ROMGBs had a relatively better day with mixed interest, though buyers seem to have dominated judging by the 2-3 basis point drop in the yield curve, similar to regional local currency sovereign debt markets. Today, the Ministry of Finance plans to sell on the local market EUR100 million December 2023. 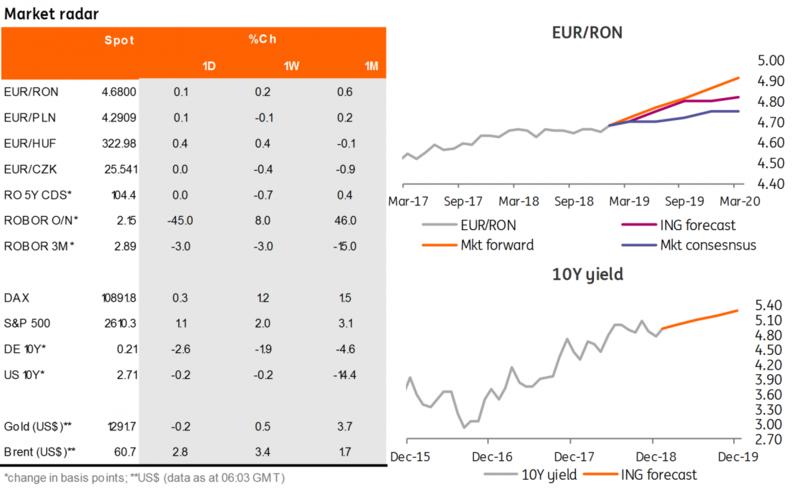 The context doesn’t seem supportive for accumulating low yielding assets, but given the large redemption of EUR929m on 21 January, we could see some roll-over demand. Cash rates have resumed a downward trend as we approach the end of the minimum reserve period. Overnight implied yields closed around 1.70% while longer dated tenors remained unchanged.